Chronic, low-level inflammation has been linked to a number of chronic diseases including cardiovascular disease and diabetes. The higher the inflammation levels, the higher the risk of developing chronic disease. Sometimes an individual will experience symptoms such as joint pain or fatigue, but often times there will be no symptoms until disease occurs. Therefore, the only way to know what your inflammation levels are is to measure them. GrassrootsHealth offers two tests that provide information about your levels of inflammation: C-reactive Protein Test and AA:EPA Ratio Test, both part of the Inflammation Panel Test Kit. C-reactive protein (CRP) is a biomarker for inflammation. Elevated CRP levels have been linked to metabolic syndrome, future heart attacks, stoke, peripheral arterial disease, and the development of diabetes. Included in our Inflammation Panel, the CRP test uses a high sensitivity assay, hs-CRP where “hs” means high sensitivity, to detect small elevations in CRP. Evidence suggests that levels below 1.0 mg/L indicate low risk of cardiovascular disease, levels between 1.0 and 3.0 mg/L indicate average risk, and levels between 3.1 and 10 mg/L indicate increased risk (levels above 10 mg/L most likely indicate an acute infection or injury). Lifestyle changes such as increasing exercise, losing weight, and quitting smoking can lower CRP levels in the long term. What are the CRP Levels Among GrassrootsHealth Participants? 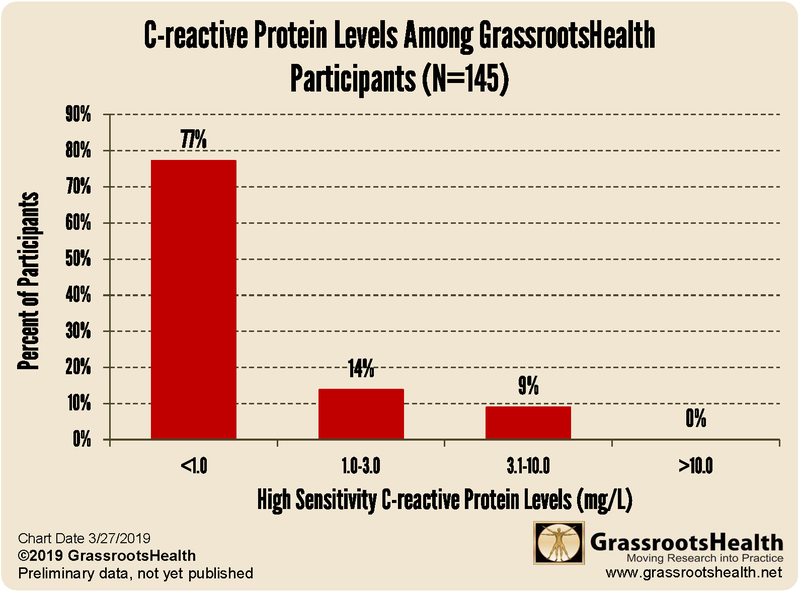 The chart below shows the CRP levels among the first 145 GrassrootsHealth participants to take the test. More than three quarters (77%) have CRP levels <1.0 mg/L. What is the AA:EPA Ratio? The AA:EPA ratio is a measure of the primary pro/anti-inflammatory omegas (arachidonic acid and eicosapentaenoic acid). AA is an omega-6 found in cooking oils, processed foods, and animal products that promotes inflammation which can lead to the development of chronic disease. EPA is an omega-3 found in seafood (primarily fatty fish) and most marine-based omega-3 supplements that can reduce inflammation. As part of either the Inflammation Panel or as an add-on to our Omega-3 Index test, you can find out your AA:EPA ratio. Generally, a lower ratio is better for health; however, the optimal range for health has not been established. Some experts consider the desirable range for the AA to EPA ratio to be 2.5 to 11; others consider a range or 1.5 to 3 to be low risk, 3 to 6 to be moderate risk, 7-15 to be elevated risk, and above 15 to be high risk. Knowing your ratios can help you take more specific steps to achieve an ideal ratio, mainly by increasing intake of EPA. What are the AA:EPA Levels Among GrassrootsHealth Participants? 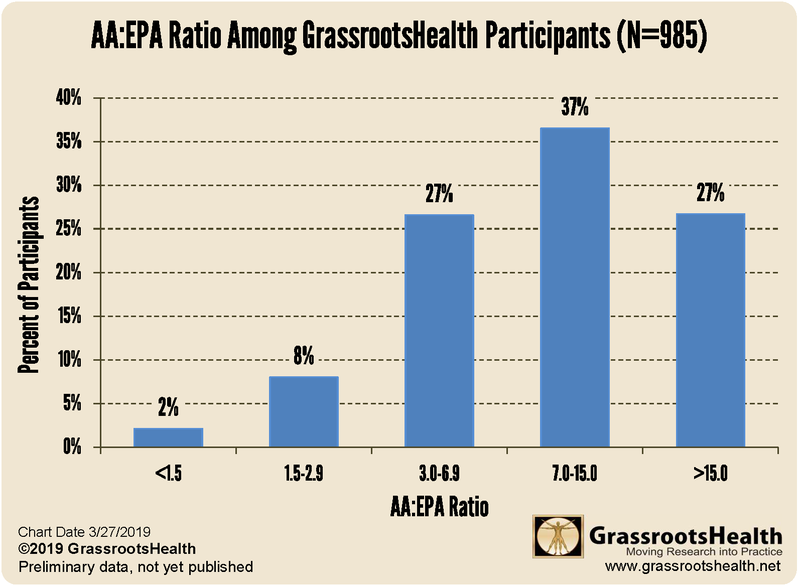 The chart below shows the AA:EPA levels among 985 GrassrootsHealth participants. Almost two-thirds of participants (64%) have an AA:EPA ratio of 7 or higher. How can I track my CRP and AA:EPA levels? To help you track your nutrient and inflammation levels, GrassrootsHealth has created an online tracking system called myData-myAnswers. This will help you know how your nutrient and inflammation status impacts your health. Check it out today!